Bread is a major food issue for many. They may want to go gluten-free or they are trying to avoid carbohydrates because they are trying Atkin’s or South Beach or any number of diets that reduce bread, pasta, and rice. I do not believe the problem is carbohydrates themselves but a problem of portion control. The size of our slices of bread, hoagies, subs, and slices of pizza are enormous. Think about it, if you are a food manufacturer don’t you want your food to look big? And isn’t a honking large bun going to make it look large for no money? Go look at a photo of a burger and then come back here. Mega bread. All you have to do is get the bread size in check and you can have your bread and eat it too. The photo above is of a pastrami sandwich that I made with a 100-calorie slider roll. 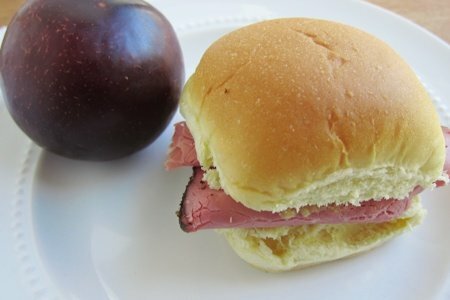 Are pastrami sandwiches healthy? Nooo. But, I love them so I made a little one and enjoyed it. 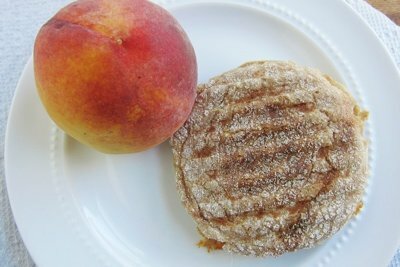 I made this with a slice of Vermont cheddar and a sprouted 100% whole wheat English muffin that tasted divine. The muffin was 130 calories. I can still have my grilled cheese! I have tried Arnold’s sandwich thins and I don’t like them because they have too many ingredients (and one of them is sucralose). I do like finding smaller versions of healthy breads. I noticed that Whole Foods put out a smaller loaf of bread. I was grateful because their regular slices are about 1/3 too big for me, but I like their bread because it doesn’t have any preservatives. How do you deal with too much bread? Please share. Carbohydrates have gotten a bad rep. They are the macronutrient that you don’t want to meet in a dark alley (notice the crime tape in the above photo). This is such a great topic.thanks for exploring it. I also use spelt or sprouted grain breads. I count points + and would love to find a 1 point sprouted grain bread in the south. The Midwest has a great one in many varieties ....I forget the brand. I like your approach. Unless we are highly allergic to a certain food, most of us are going to eat what we like occasionally. You just try to find better options of what you like and try to make your calories count towards good nutrition. Knowing you can have a bite of something is better than completely avoiding a certain food or food group. It often becomes an obsession. My boss lost 80 pounds by cutting out sugar, but she is obsessed with it and cooks with it for other people, but she won't eat it. She's afraid if she does, there will be a point of no return. I also like your subtle message of having your bread be about the size of a piece of fruit. As you know, WW gives portion size suggestions (i.e. protein about the size of the palm of your hand), and much smaller portions of bread is a good one. We used to have bread with dinner most nights (plus another carb), and have tried to cut it out most of the time. Also, try to say no to bread at restaurants - or limit yourself to 1 piece and then have it taken away - this is tough! Great topic! I am a carb junkie and am trying to learn how to curb it. This really helps me on my journey. I have been more aware of the type of bread I am buying. I am working on switching from white flour to wheat and getting white carbs out of my cabinets. Not easy. Trader Joe's has sprouted bread, wheat, rye and whole grain for one point per slice. Really good. My Weight Watcher's leader told me about them. Trader joes has 100 calorie sandwich thins and 110 calorie bagel thins without any truly awful ingredients or stevia or sucralose. Very tasty too. Just another option. I make flax meal bread and use for a sandwich. I have a recipe that is great and no preservatives. I do mostly open-faced sandwiches on good sprouted-type bread. Sometimes I loved an old-fashioned grilled cheese too so I use ciabatta bread, small very holey slices. I only eat a bread-type product every other day. I'm always trying to replace a food I view as ''not so good for me'' for a better choice. It is a battle esp if you have certain comfort food cravings [like grilled cheese sandwiches with tomato soup!!]. I am a fan of the whole wheat english muffin as forced portion control. Grilled cheese, tuna salad, chicken salad, lunch meat, breakfast sandwich, tomato & mozzarella...they all work well with an english muffin. Hi, Have you tried Ezekiel bread? It is sprouted. 80 calories a slice and only 14 carbs. Very good!!!! Beware of lower calorie bread with cellulose - wood fiber! Read those labels! Carbs are fine as long as you are balancing it adequate protein. This will keep your blood sugar stable and reduce cravings and allow you to start losing fat. I personally don't eat much bread. Most of my carbs come from fruits, veggies and oatmeal. I make my own whole wheat bread using honey instead of sugar (which in my opinion is more of an issue than gluten). I bake it in Anchor (American company) 1.2 qt rectangle cookware; which makes 3 loaves instead of 2 from a typical 9x4 bread loaf pan. When I make sandwiches, I slice the bread as thin as possible without it falling apart. I find that the recipe I use allows for thinner cuts than white bread recipes. I also find that since the loaf is smaller, we are able to use it while it's still pretty fresh (typically 2-3 days if kept in the fridge). It's a lot tastier than store-bought bread. It takes a day using a small kitchenaid mixer to make 6 loaves - 5 of which freeze/defrost very well (can't even tell the difference from fresh). I prefer to make my own or buy from my favorite bakery, real bread with simple ingredients, mostly whole grains, and use one slice, not two, for half sandwiches or accompanying a meal as the only carb. If I have sweet potatoes or pasta, then there is not real need for bread, and instead I add veggies. I, too, prefer homemade bread, sliced thin, etc., [use no-knead recipe on king arthur site] but mostly do this in the winter months. But I wanted to share what a friend who is presently working on a better lifestyle just told me: She makes her daily sandwich using Joseph's flax pita bread, just folds it half vs stuffing it, its only 60 calories!! I googled it and it looks like they also make an organic version for 80 calories. Not a bad choice for busy working moms! Thank you snack girl for all the great subjects and info you generate. I Hollow it Inside Outside Then Throw It Away. Proffessionals Scoop Out Their Breads. Nature's Own and Sara Lee have loaves that are 40 to 45 calories per slice. It is great for toast and sandwiches especially. These are our favorites and easy to find. I'd love that flax recipe, if Victoria come back to this post! Thanks in advance!! In light of my recent comments (and debate) about bread on this blog recently, I love this article. I buy bread that has 70 calories, 7g fiber, 5g protein, zero saturated fat, and zero trans fat per two slices. I challenge anyone to convince me there is anything wrong with that. Thank you for this eye opening advise. Here is a link that shows a picture of the bread. Hope this helps...also comes in Rye and Whole Wheat. I plan meals around bread and not one roll or slice is healthy. I like to buy ciabatta rolls, buns, or sub rolls and scoop out the centers as far down as I can without tearing the crust. I always slightly toast (too toasted dries and breaks the crust shells) or grill the bread to bring out the yeasty aroma and taste I love. With scooped out centers I can add more of the healthy stuff for sandwiches or lightly butter or cream cheese for a meal side. I'm an obsessive label reader but...somehow I missed that the sandwich thins I used to buy pretty regularly have sucralose, an ingredient I avoid completely. Well, boo. I haven't bought them in a while but now I'll never buy them again - thank you Snack Girl! I have stopped eating most bread and I am surprised to find I really dont miss it. I will use Wasa crackers,the light multi grain or plain rice cakes. I made a sandwich last week for lunch using only 1 slice of bread and could not believe just the one slice was 110 calories. If you like flat wraps, try Lawash brand. They come in both white and wheat. The white is 1 WW point and the wheat is 2. They have no sugar! They are about 12 inches and can hold so much, which is good because a wrap is all about what is inside. Bread makes me so bloated .. ugh. I've tried sandwich thins, but find them un-appealing. They are 'too thin'. Most gluten free breads are .. meh. Too dry. Oh, well, I guess it makes me eat more salads. Carbs are necessary, especially if you do a lot of physical activity. Just don't overdo the portions. All things in moderation is the key. There are 100 calorie "slider" smaller rolls in most grocery aisle and wheat and "fun" flavors as well...I saw jalapeno cheddar and asiago cheese last night...and Aldi has their own brand "Loven Fresh" sandwich thins that are 100 calories. Get bread at Panera sliced thin or any bakery and it will be 100 calories or less....eat bread once a day if you like it...then try to get carbs from other sources....oatmeal, cereal, rice, tortilla chips, pita chips, bagel chips, veggie chips, sweet potatoes, peas, corn, lots and lots of choices out there!